A man's fade haircut is a style that starts very short toward the hairline, over the ears and around the back, but is left longer as you get toward the top of the head. The haircut is meant to "fade" from short to long, with no line of demarcation. A fade can be very short, or it can be longer depending on the length of the beginning clipper guard. To perform a fade haircut, you will need hair clippers, clipper guards, hair cutting comb, cape and trimmers. These items can be purchased in a beauty supply store. 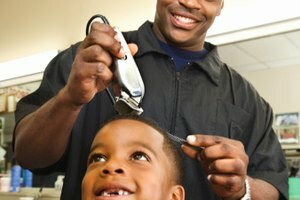 A men's fade can start from a zero (no clipper guard) to a No. 4 clipper guard and still be considered a fade. The lower the number of clipper guard, the shorter the haircut will be. Clipper guards range from zero to eight, but only zero through four are considered fade length. Clipper guards numbered six through eight are sometimes used on the top of the head to cut the longer hair. 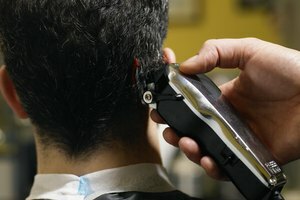 When clipper guards longer than a four are used on the back and sides, it is considered a regular haircut. Ask the client how short he wants his hair. If the client wants to see skin, he may want a zero to a three, depending on hair thickness. The thicker the hair, the shorter you can cut without seeing any scalp. Zero is almost no hair, a one is 1/8 inch, a two is 1/4 inch, a three is 3/8 inch, a four is 1/2 inch, a five is 5/8 inch, a six is 3/4 inch, a seven is 7/8 inch and an eight is 1 inch. Most clipper guard kits do not include a No. 5 or 7; they usually have to be purchased separately. After you have determined what length the client wants his hair, choose the appropriate clipper guard. Have the client bend their head down with their chin on their chest. Begin at the nape of the neck with the shorter clipper and, with the back of the clipper facing toward you and the teeth of the clipper guard facing up. Move the clipper guard from the bottom of the hairline, into about 2 inches of the hair, cutting as you go. 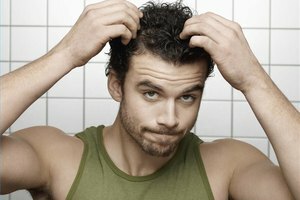 As you bring the clipper up through the hair, pull it out toward you as you go through the hair. Bring your hair-cutting comb down through the top of the hair in a combing motion to meet the clipper at the point where you want to stop cutting. This will stop the guard from going farther than you intended. Cut the entire hairline in this fashion, then move around to the sides of the head, pulling the clipper up and gradually out as you move up through the hair. Keep the cut area even around the head, but try not to create a line. You pull the clipper up and out to gradually lengthen as you go up and avoid a line. If you do create a line, you can fade it later. After you have cut the bottom section of the hair, remove the first clipper and add a clipper guard two levels up (if you started with a Level 1, put on a Level 3). Begin again at the nape, and using the clipper as stated above, cut the hair another 2 to 3 inches up the head. Bring the clipper up and out as you go, and use your comb to meet the clipper guard. The hair will have a line of demarcation at this point. Remove the clipper guard, and put on a guard that is one level lower. Use this clipper to blend the "line." Start blending below the line, and bring the clipper about a 1/2 inch or so to above the line, moving up and out as you cut and bringing the comb down to meet the guard as you go. Cut around the head, from the back and through each side. The cut should end about the temple on each side of the head. Stand in front of the client and look at the "line" that still exists where you ended this last cut. Both sides of the head should be even. Examine the back as well. The haircut should be even around the head. Attach a clipper guard one level higher than what you just used. You will use this to blend the sides into the top of the head. Follow the guidelines above for clipper cutting, and, beginning at the back, cut by moving the clipper up and out and bringing the cutting comb down toward the clipper. Only cut approximately 1/2 inch to 1 inch into the top section of the hair with the clipper. This cut is only meant to blend the line of demarcation. Use a clipper or scissors to cut the hair on top of the head. If the client wants his hair an inch long or less, use the appropriate clipper to cut the hair. Start at the back and bring the clipper through the hair in the opposite direction of hair growth. When you get to the hairline, determine if the client wants this area longer. If not, move the clipper in the opposite direction of hair growth, combing after each section is cut. 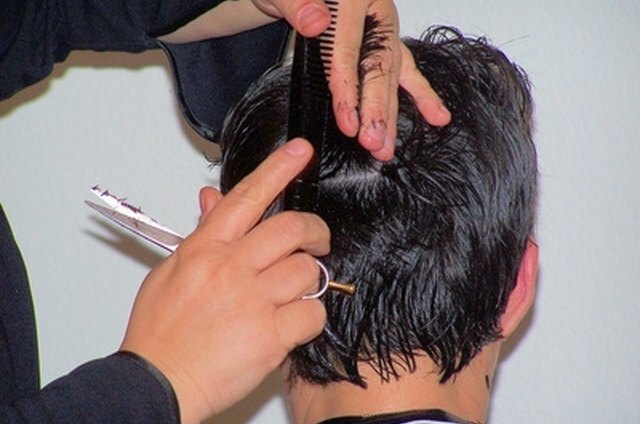 After the bulk of the hair has been removed from the top, go back through the hair, moving the clipper in multiple directions to be sure every hair has been cut. After the top clipper cut is completed, run the cutting comb through the hair opposite the direction of hair growth and examine if there are any long, uneven hairs. Using the scissors, cut hairs that are not even by holding the scissors horizontally and cutting parallel to the scalp. To scissor cut the top of the hair, first determine if the client wants a straight hairline. If he does, cut the front of the hair to the length desired by holding the scissors horizontally and parallel to the forehead. Use the cutting comb to hold the hair down, and follow the line of the cutting comb to get a straight cut, or hold the hair between your index and middle fingers, with the inside palm facing you, and cut below your fingers, following the line of your fingers to get a straight edge. After you have made the initial cut, section a 1/2-inch piece of hair from the middle portion of the head, and directly down the middle of the head as if you are making a middle part. Pull the hair up and comb smoothly. Hold between the index and middle finger, with the palm facing you, and using the front as a guide, cut the section to the length of the guide Pull 1/2 inch sections from either side of this part into this initial cut, that you will now use as a guide, until the top section is cut temple to temple. Now take a section from the crown of the head that is horizontal to the hairline and about 1/2 inch in thickness and as wide as the fingers. Comb this section smoothly up, and cut straight across until even. Take individual horizontal sections until the whole top of the head is cut evenly. Using the top of the head as a guide, slice 1/2-inch sections down the remaining side sections of hair that were not cut by the clipper, and blend them into the top with the scissors by cutting as stated above. If the client likes the hairline jagged, do not cut a straight bang but still use the front as a guide. Check the cut by looking to see if there are any lines of demarcation. If there are still lines, use clipper guards to blend any areas that appear uneven by taking cutting the area with a clipper one level higher than the lower section to blend. Most clippers also have a 1/2 that can be added to every guard length by moving a lever on the side of the clipper. Use this half length, in addition to the the bottom length guard, to blend levels above by pulling the clipper up and out as you cut with the guard and the half lever engaged. You can also lay your cutting comb flat to the head in the area that needs blending, and cut hairs that stick out of the comb using the clipper with no guard. Be careful with this scissor-over-comb technique, however, because it does require some practice. To trim the edges of the hair, determine what the client wants to do with his hairline and sideburns, For a faded hairline, do not cut a straight line across the back but only clean up loose hairs on the neck. For a straight hairline, use your cutting comb as a guide by laying it horizontally across the nape of the neck where you want to cut with the teeth facing the hairline. Cut below the comb, but follow the hairline pattern. Cut sideburns to the top of the ear, middle ear or below, and use trimmers to clean any hair growth behind the ears, creating a clean outline. To tape the edges, trim the front of the hair around the hairline and temples as you did the back, being careful to follow the existing hairline to create a clean edge. Always cut and trim below the comb.